Motorbikes and lumbering cows, intricate arches and lake reflections, tangled cables, watchful locals, the flash of colour against earth tones — Will Taylor SGFA tries his hand at capturing the look and feel of India. 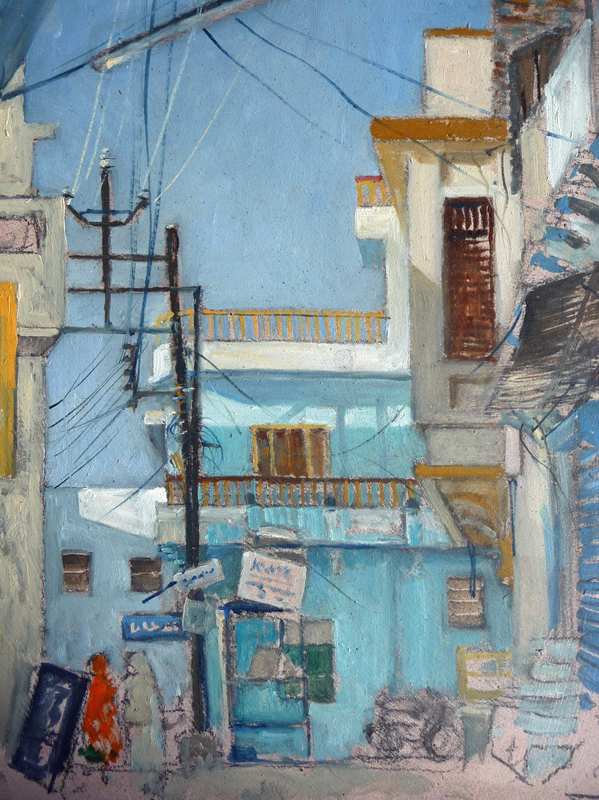 “In February 2014 I set off on a painting trip to Rajasthan, India organised by James Horton, President of the Royal Society of British Artists, together with eight other artists. I was excited, but didn’t know what to expect. We were all from different backgrounds, and for me it would be a crash course in plein air oil painting. 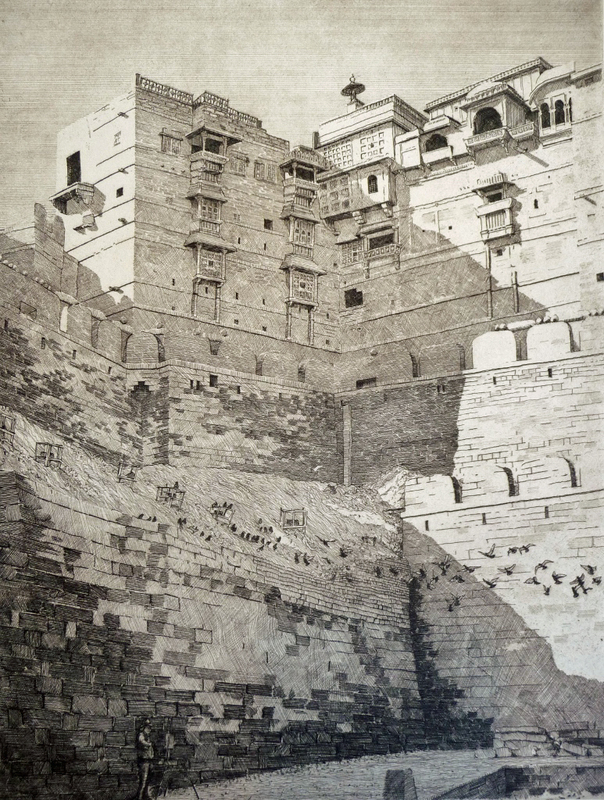 Amongst other places, we visited Udaipur, Dungapur, Jaisalmer and Jodhpur, and I returned home bearing sketchbooks filled with pencil, pen and wash and watercolour sketches, as well as oil paintings on board and about a thousand reference photographs. 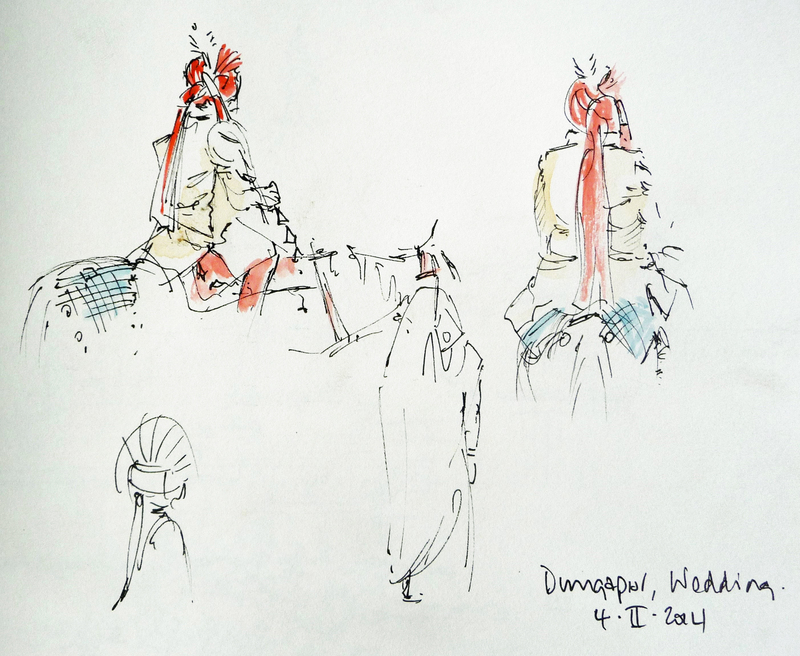 The Camel Fair at Jaisalmer These are really quick sketches made while standing on the dunes. 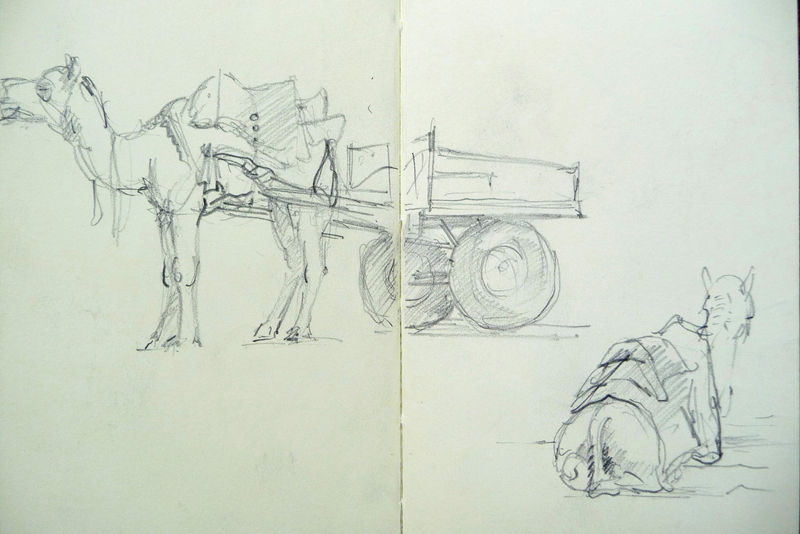 Camels, monkeys, tuk-tuks and hand carts invariably move off when you stop to look, someone will stand in your sightline, and the always-astute locals will look directly at you even when you try your best to draw or photograph them discreetly. The Main Square of the Old Fort, Jaisalmer A good vantage point is often a restaurant table, where an added distraction is your travelling artist companions. Sometimes just drawing what happens to be in front of you works as well as fussing over what to draw. 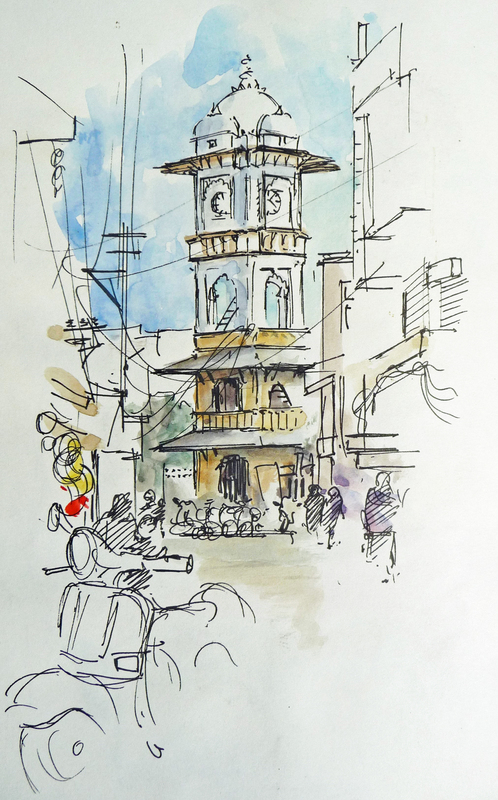 Back Street, Udaipur I made this pencil sketch in seconds as a layout prior to painting. 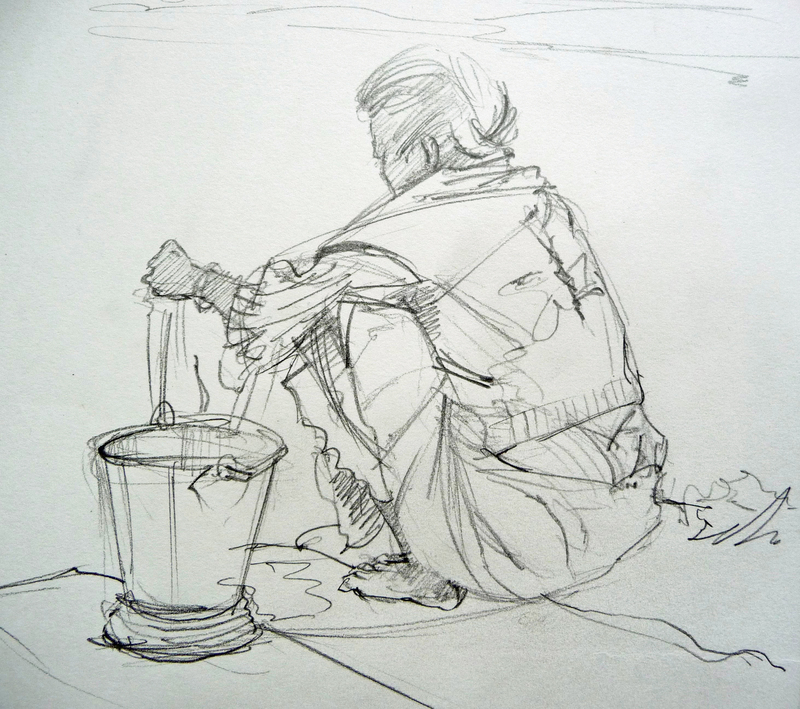 With so many different ways to approach a scene, a quick first sketch helps to set a framework. 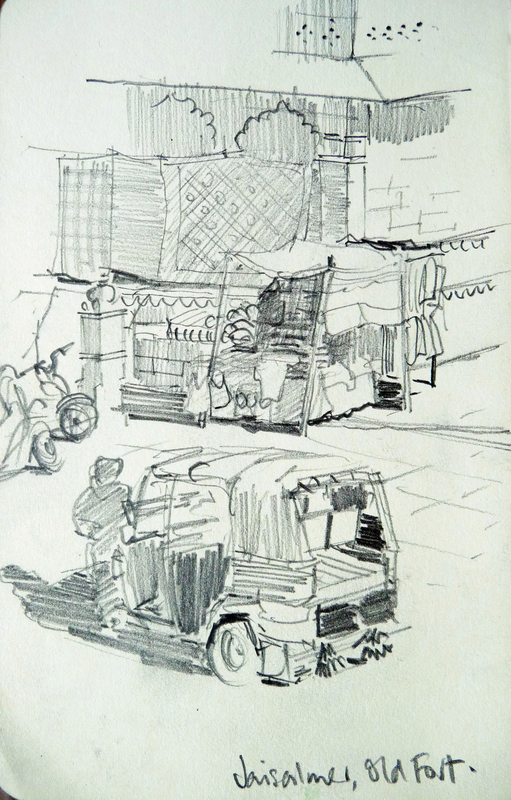 Your chosen subject matter changes from moment to moment: light moves and changes character, delivery lorries stop for long periods at a time, people and animals pass through and shop shutters open and close at odd times. There are also practical impediments. Your subject may be well lit, but you on the other hand must avoid direct midday or afternoon sun. If you’re not sitting against a wall, a large crowd may form behind you, keen to “help”. If you’re painting when school finishes for the day, a boisterous young crowd will pester you with requests for pens and brushes. The oil at left was my first effort at a street scene. It was completed in two hours as I sat on the front step of a house while balancing a pochade box on my knee. I was under constant threat from pigeons, and endured the close attention of children in the house. Hanuman Ghat, Udaipur James recommended this relatively quiet spot at a temple by the lake. At various times during the afternoon, women came down to wash pots and then wash at the end of the day. Arriving there first and sitting quietly in the background, I found that no one seemed to mind my presence in such an intimate setting, and I was able to made fast pen sketches of the figures. For the rest of the time I worked on another oil-on-board sketch. I had a wealth of images from the afternoon here that I could later work up in the studio. 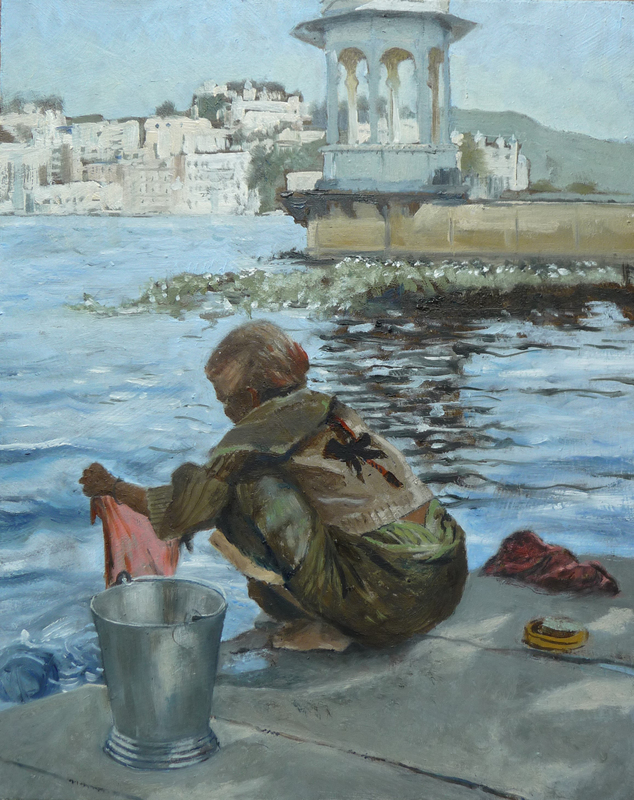 The Clock Tower, Udaipur It was difficult to know how to prepare for the trip, but before I set off for India I had seen the wonderful plein air work of Peter Brown NEAC, in particular his India oil paintings. This clock tower was the subject of a number of his paintings, so I was fascinated to find and draw it for myself. 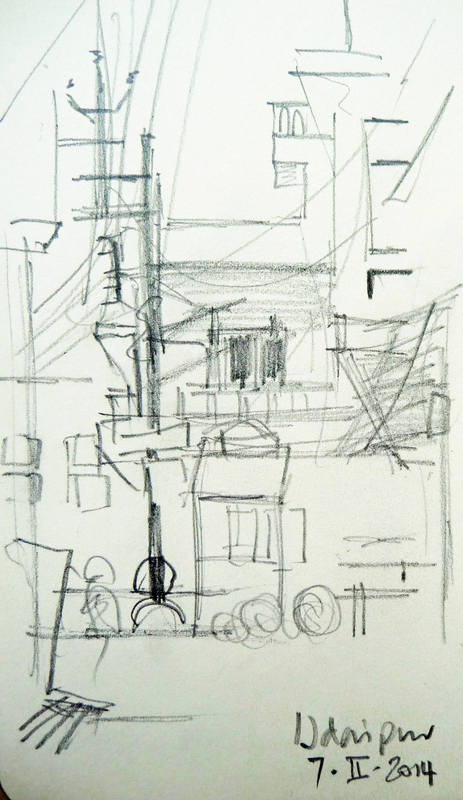 I drew with the sketchbook on my knee in one of the busiest spots in town while sitting over an open drain. Jaisalmer Fort The large square under the daunting fort façade was a wonderful place to paint. I arose very early before breakfast, partly because I was eager to start, partly in order to work during cooler hours in early light. The scene ran east to west, and the light and shadows moved very quickly over the façade. I made three oil sketches here. This oil on board was created in situ. Working quickly, I had no particular oil technique in mind and my natural style was to create something more like a line and wash drawing. I later worked this into the larger format etching shown here. var. 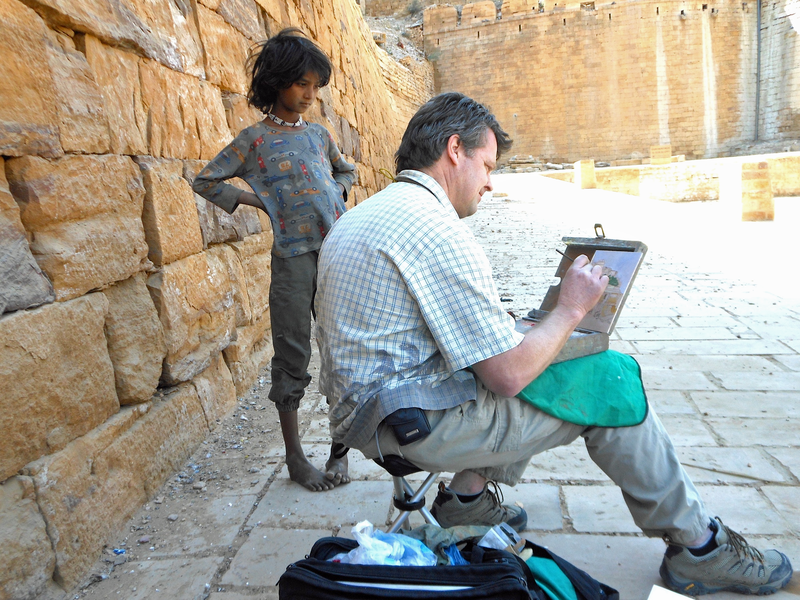 Jaisalmer, Mehrangarh Fort, Jodhpur One of the things I learned on the trip is the importance of working at scale. But I enjoyed the freedom of working quickly in this small book with a small brush and a limited palette. This worked particularly well at hotel tables with a view and a beer. 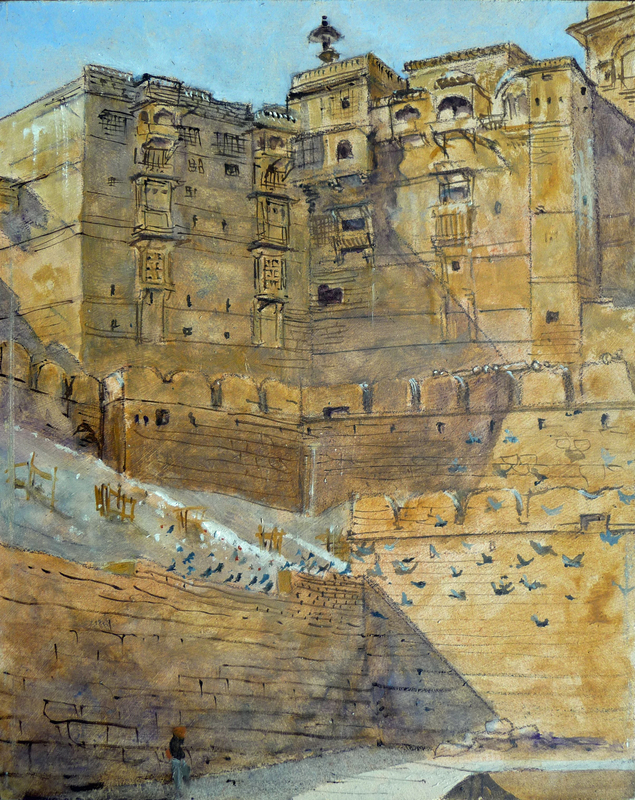 var Jaisalmer, Mehrangarh Fort, Jodhpur – watercolour in A6 Moleskine landscape watercolour sketchbook. 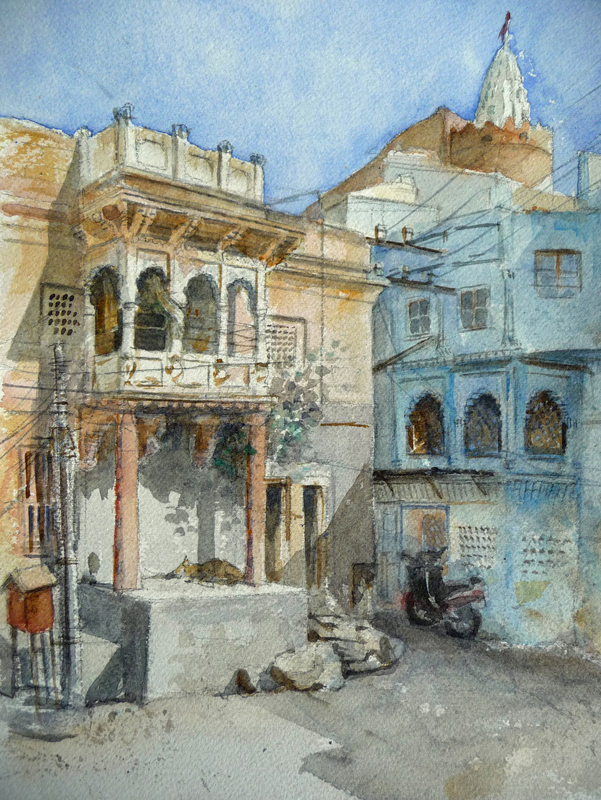 Street Scene, Beneath the Fort Jodhpur Old Town I completed this in situ in two separate sessions. It was a good painting spot just outside our guest house. It may be overworked, but it was a useful exercise to keep developing the sketch when much of the other work was done with necessary speed. Will Taylor SGFA is an artist and printmaker. He grew up in Liverpool and now lives and works in Rye, East Sussex UK. He is a member of the Society of Graphic Fine Art and the Rye Society of Artists. Originally educated at Imperial College as a mechanical engineer, he attended short courses at the Slade School of Fine Art and Kent Institute of Art and Design, but is otherwise a self-taught artist. Will works in a variety of media, each relying on clear draughtsmanship. In printmaking he uses traditional etching techniques and explores the strong use of line; in his large charcoal studies he explores tone, texture and character. Will’s subject matter is mainly figurative, and draws on an eclectic range of subject matter, from science and engineering to architecture and animals. He develops ideas from notebooks, his local environment and worldwide travel. This entry was posted in The Sketchbook Series, Uncategorized and tagged Dungapur, Imperial College, Jaisalmer, James Horton PRBA, Jodhpur, Kent Institute of Art and Design, Peter Brown NEAC, Royal Society of British Artists, Rye Society of Artists, SGFA, Slade School of Fine Art, Society of Graphic Fine Art, Udaipur, Will Taylor. Bookmark the permalink.